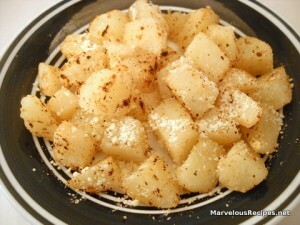 A delicious alternative to French-fried potatoes! All the flavor you need without all the fat you don’t need! This recipe is perfect for using up left-over boiled or baked potatoes! 1.In a medium skillet, heat the oil. Add the potatoes and garlic; cook, stirring constantly 5 minutes or until the potatoes are lightly browned. 2.Remove from the heat and sprinkle with the cheese, and pepper. Makes 2 servings. Per Serving: 123 calories, 3 g Total Fat, 0 g Saturated Fat, 1 mg Cholesterol, 21 mg Sodium, 23 g Total Carbohydrate, 2 g Dietary Fiber, 2 g Protein, 23 mg Calcium. I’m a giant fan of home fries and probably like them better than fries – yours look really good. I am soooo….tired of french fries. I have to have a real desire to eat FF anymore. These potatoes look tasty. A welcomed change to a meal in my opinion. Hope to try these soon. Mmm, those might be on my plate for breakfast tomorrow! Stop by my book review blog, Read, Review, Repeat for a chance to win one of Madeleine Wickham’s latest hardcover books!